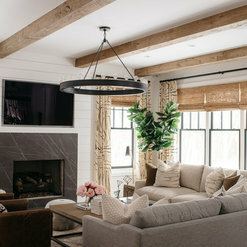 Livingston County's Elite Interior Designer - Best of Houzz 2017-19! Leighanne LaMarre is a exceptional designer. As a builder it is critical that a designer understands constructibility, is flexible in finding solutions, can come along side the team in conflict, and is responsive to the needs in the field. They are exceptional at these skillsets and highly deserving of five stars. Leighanne, Rachel, and the whole team were truly a pleasure to work with! Thanks guys! We had a blast working with you, and look forward to working together again soon! 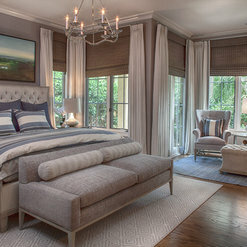 I highly recommend Leighanne LaMarre Interiors! They are everything that I was looking for in an interior design firm. I had several criteria when interviewing interior design professionals, and Leighanne LaMarre and her associates met or exceeded my expectations on every one. 1.Leighanne LaMarre and associates all have design savvy and an excellent ability to illustrate their vision. First, they did a wonderful job listening to us, getting to know taste, and understanding how we planned to use our space. (For example, we have three kids and have company over a lot, so Leighanne LaMarre ensured that all of our fabrics and furnishings would be very comfortable, yet stain-resistant and durable!) Throughout the planning, they produced mood boards, illustrations, and floor plans to show us exactly how things would turn out. They provided design renderings with measurements for all contractors to ensure that the specs were carried exactly as intended. 2.Leighanne LaMarre and associates are professional, easy to work with, and very organized. Whether in meetings, phone calls or e-mails, Leighanne LaMarre always communicates clearly and efficiently. Invoicing is timely. They are always responsive when you have questions. 3.Regarding cost, Leighanne LaMarre’s design services are priced fairly and competitively. I will confess that I wasn’t prepared for how expensive design services, high-quality furnishings and renovation work would be. 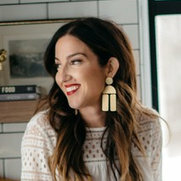 However, Leighanne LaMarre educated us on what to expect, which items are worth splurging on, and which items can be more budget-friendly without sacrificing quality. Overall, we are thrilled with how our project turned out. The plans evolved into much more than we initially imagined, but we are beyond delighted with the outcome. Erica and I had an absolute blast working with you Kate- and we miss seeing you! Thank you for the kind review, and we hope that we can work together again soon! I've been fortunate to have Leighanne helping me with furnishings, art, accessories, wall coverings and paint, window coverings, cabinet design/kitchen design and installation in my home in Ann Arbor since we moved in 6 years ago. She has created delicious combinations of color, texture and scale --in all price ranges--that my husband and I will love for years. She certainly has a gift for functional and stunning. It is such a pleasure to work with her-- our meetings are so much fun because I can just relax with the understanding that she knows exactly what she is doing and gets it perfectly right every time. My project was unique in that my husband and I were adding 2200 square feet to our existing house on the lake that was originally built in the 1940's. Therefore, I was going for a transitional design style and quickly realized I needed help thinking through all the details! I hired Leighanne late in the building process and she was able to quickly assess my style and likes after visiting our site, looking through my Houzz and Pinterest accounts and listening to my vision. Leighanne is extremely organized and I was more than impressed during our first meeting at her design office. She and her team were prepared with computer generated (to scale) design layouts, furniture options, varying fabrics, custom rugs, woods, etc.. Beyond Leighanne's eye for design and efficient processes, her ability to blend beautiful and functional amaze me! She could "see" things I never imagined. 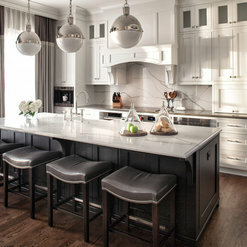 Every space is beautiful and functional- I love every piece of furniture and all the varying layouts. Friends and builders cannot tell where the old and new start and finish. Leighanne and her team are a pleasure to work with! They listen, they are patient, they make it fun, and the results are fabulous! 100% satisfied--beyond my imagination and expectations!! Leighanne was so great to work with. My wife and I know what we like when we see it, but sifting through all of the options and making sure it all works together is not our strong suit. Leighanne was on time, worked with our budget, and delivered an end-result that exceeded our expectations. Communication was was prompt throughout the entire process. We are very pleased with the transformation that Leighanne made to our home! We loved the project we did with her in December 2015 so much that we rehired her to complete another room in April 2017. I have worked with Leighanne LaMarre for the past couple of years. She has a great ability to pull together elements that are both aesthetically and functionally pleasing, with the very important detail of caring for people. I recommend her to my design clients for these reasons. Anyone can create a beautiful space, but remembering that the space is for unique people with specific dreams and desires, and taking their hearts into consideration to serve them well is a rare quality that Leighanne always keeps at the forefront of her mind. 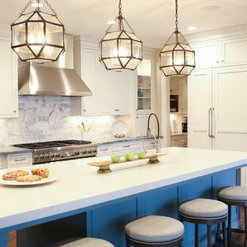 I've used Leighanne LeMarre Interiors for several projects in our home beginning with lighting selections during construction to detailed layouts, design and production selection for our foyer, dining and great rooms. Leighanne and her staff are incredibly talented and her product and fabric suggestions were perfect for the style of our home, our personal tastes, and within our budget. Leighanne has an amazing eye for detail and works closely with her clients to incorporate their vision while creating an end result that is both visually stunning yet functional and comfortable for our families needs. Highly recommend! 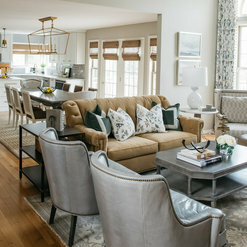 My husband (who likes more modern minimalist pieces) and I (who like more contemporary to traditional pieces) bought a very traditional grand colonial home and had no idea how to blend our personal styles together, let alone in a very traditional looking colonial. Our friends had used Leighanne and we loved their home so we contacted her via her Facebook page. From there we were able to do almost all communication via email or in person at her studio (or in our home). Communications were always pleasant, easy, and constructive. Pricing - We had no issues working with Leighanne toward a budget within our comfort zone. She made excellent recommendations for which pieces to go with the higher cost item vs. which pieces she could suggest a different item that would still perfectly fit the design, but not hit the budget. Design - With my husband and I being so different, design choices were often a fighting topic for us when working on our own. One of the things I was most impressed with was what a great job Leighanne did at creating designs that we both loved and fit the home. It saved us many arguments and I am grateful for that. 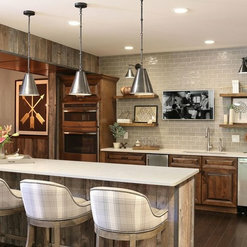 It is also very different from our friend's home which proved to me how great she is at designing for you and not just that she has a specific style that she puts in every clients home. I had actually started at one point struggling with thinking maybe we made a mistake in getting the colonial home and worrying we were not going to like it even with the updates. I can honestly tell you, that from the moment all of the pieces came in, the house was completely transformed into being "our home" and I have loved it and felt at home ever since. Everyone who comes into our home Oooh's and Aaah's and asks "Did you do this yourself?!" and I am happy to respond with "No. I used Leighanne LaMarre and would not use anyone else." What a truly amazing job Leighanne did for us. Her vision and talent is incredible. I'm so fortunate to have found her. Commented: What material is the counter top, it is beautiful!This material was selected by the homeowner prior to us obtaining the project, but it was definitely a type of granite!